Maggid Devarav LeYaakov, Likutei Amarim, by the Maggid R. Dov Ber of Mezeritch (Mezhirichi). Korets: R. Tzvi Hirsh son of Aryeh Leib [Margolies] and son-in-law R. Shmuel son of Yissachar Ber Segal, . The title page reads: "The book Maggid Devarav LeYaakov (the last letters of the name of the book are emphasized on the title page, alluding to the name of the author, R. Dov), selected discourses… pure sayings… hearken to the words of the king… every month and every week… from the great and holy Torah scholar…. R. Dov Ber, who was a preacher in Mezeritch and other communities…". This is the first book of the teachings of the Maggid, R. Dov Ber of Mezeritch, to be published, and the third Chassidic book to be printed, approximately a year following the printing of Toldot Yaakov Yosef and Ben Porat Yosef, in the same printing press. The book was brought to print by R. Shlomo of Lutsk (author of Divrat Shlomo), close disciple and relative of the Maggid of Mezeritch. R. Shlomo wrote two comprehensive prefaces to the book, which are renowned in the Chassidic world. The first portrays the elevated stature of his teachers, the Baal Shem Tov and the Maggid of Mezeritch, the Divine Inspiration which rested upon them and the lofty levels they reached. He characterizes the teachings of the Maggid as replete with allusions to writings of the Arizal and the Zohar, and describes the power his words had to enthuse his many listeners in their service of G-d. The preface continues with an account of the Maggid's testimony on all the kabbalistic teachings and lofty secrets his teacher the Baal Shem Tov taught him, including the language of birds, Holy Names and teachings of the book Raziel. The author relates that the Maggid showed him in that book some names of angels, testifying that the Baal Shem Tov knew how to use those names to determine, in the month of Nissan each year, which celestial administrators where appointed to govern the world, in order to know how to handle them. Later in the preface, the publisher conveys his hesitancy to print the book, and his exchange with his teacher on the matter. When his teacher inquired as to why he refrains from writing down what he hears, he replied that he had seen some who record the Rebbe's teachings, yet since their notes are based on their own understanding, they fall very short of the teacher's intent. The Rebbe told him to nevertheless record the teachings, assuring him that the results would be satisfactory. These prefaces were reprinted in his book Divrat Shlomo (Zhovkva, 1848). In an approbation the Chozeh of Lublin accorded his book, he relates to these prefaces and writes: "His character has already become renowned through the preface he composed for the book Likutei Amarim by our great master and teacher R. Dov Ber". The preface also contains facts regarding the compilation of the book. It reports that the book was composed by several writers, the main part being copied from the writings of R. Zev Wolf of Hrodna (Grodno). However, the Tzemach Tzedek of Lubavitch was bearer of a tradition that the essay beginning with the words Olat Tamid (printed on p. 29a) was written by the Baal HaTanya when he was by the Maggid. The scholar Netanel Lederberg maintains that at least parts of the book were written by the Maggid himself. In contrast, Dr. Rivka Schatz-Uffenheimer asserts that the primary writer was the Maggid's disciple, R. Levi Yitzchak of Berditchev (see: Lederberg, HaShaar LeAyin, pp. 309-311). 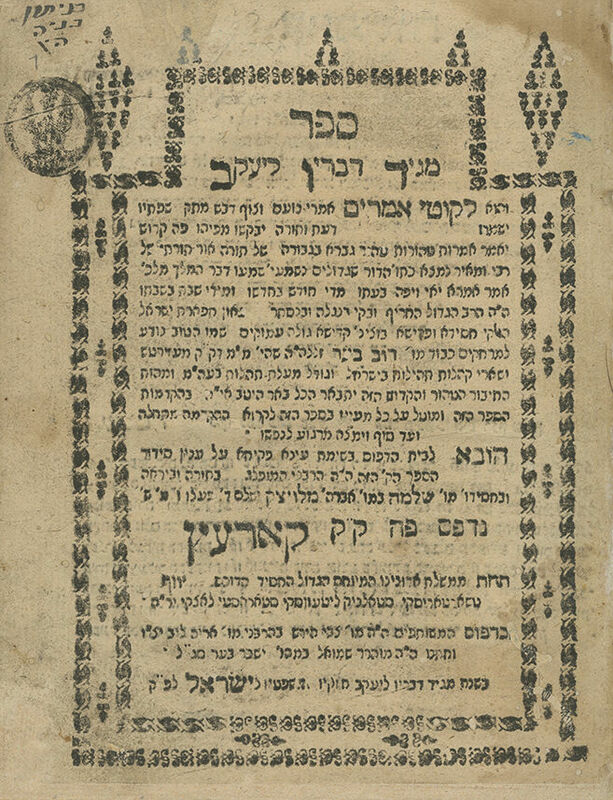 Over the years, a minor polemic regarding the attitude towards the book evolved between the Chatam Sofer and the Divrei Chaim of Sanz, concerning what is printed in this book about the Sefard and Arizal prayer-rite (p. 25b). The Chatam Sofer wrote to the Divrei Chaim in one of his responsa (Orach Chaim, section 16), that the book Likutei Amarim is not found in his community, but the passage he quoted from it is like "the teachings of the sealed book". To which the Divrei Chaim responded at length (Responsa Divrei Chaim, II, Orach Chaim, section 8), writing that "the Chatam Sofer's displeasure at Likutei Amarim is unfounded, perhaps because its author is a Chassidic leader, his words did not enter his ears…", and that the Likutei Amarim didn't write this on his own accord, rather based on teachings of early scholars proficient in both revealed and hidden realms of the Torah. , 60 leaves. 18.5 cm. Fair-good condition. Stains. Tears and worming, some slightly affecting text. The leaves were professionally restored with paper (restoration of worming and open tears at margins). Two leaves trimmed at lower margins, affecting page guards). Signature and stamp on title page. New leather binding.